One of our goals this year is to find out what lies under the Ptolemaic or early Roman Period houses that fill the area west of the Taharqa Gate. On January 25 we laid out a new square that spans the width of the gate and Mamdouh and his team got right to work. It was a productive week for Mamdouh in the north end of the new square. On the left and right, mud brick walls (Ptolemaic or Roman) discovered in an earlier season run east to the gate, whose north wing can be seen in the background. By the end of the week we had found a third east-west wall between them, partially cut by a later pit. Against its south side is a large pottery bin or jar set in a neat frame of packed mud or mud brick. Sometimes activities overlap. Bill began mapping the baked brick building on Thursday while Mahmoud continued to work in the square next to it. We are getting a number of mud brick walls, but so far they don’t make much sense. Against the long north-south mud brick wall that defines the east side of the area we have discovered a group of pottery bins or ovens, visible in the foreground. Similarly, the JHU's activities at Karnak are captured photographically on their dig diary. Have a look at the above page for some excellent photos. The Djehuty project is going ahead, with both restoration and excavation work being carried out at the same time. Photographs on the blog give a real insight into how detailed the restoration work actually is. The excavation work continues to reveal levels of complexity with more work needed to resolve some of the essential questions about the site. The work in the burial chamber, for example, has produced ceramics from the superficial levels dating from Ramesside, 28th Dynasty and Saite periods. They are waiting to see what deeper levels will produce. Excavation in the entrance to the tomb also proceeds, albeit slowly due to the difficulties of the conditions encountered. Normally the news items on this site are a day or two old. This newsletter from the IOA at UCLA is nearly two years old. It is also over 40mb in size (110 pages of A4 if you're tempted to print it out). But I have only just found it and it is full of great things archaeological. Very enjoyable. If your only interest is Egypt it may not worth the download time but there are some good articles about Egypt including Searching for Ancient Proteins by Hans Barnard on Eastern Desert ware, a brief summary to introduce the book Roman Foodprints at Berenike: Archaeobotanical Evidence of Subsistence and Trade in the Eastern Desert of Egypt By René T.J. Cappers and and an excellent article by Willeke Wendrich entitled "A cultural heritage centre in the desert". Today seems to be my day for posting information that is over a year old. Thanks to the Finds and Features blog for pointing out that the following article is available online as part of Volume 1 of the Technical Research Bulletin, available on the British Museum's website (there are lots of other great articles too, about various different objects in the museum from other parts of the globe). The British Museum holds in its collections a box of pigmented inlays from the tomb of Nefermaat, a senior official of the Egyptian Old Kingdom (early Fourth Dynasty, c.2600 bc), collected by Sir Flinders Petrie in the late nineteenth century. The pieces relate to an early, and apparently rapidly abandoned, style of tomb decoration where shapes were cut into limestone slabs and the resultant hollows filled with coloured pastes. This box of inlays thus represents some of the earliest evidence for tomb decoration available for study and reflects a very different form of decoration from the tempera painting generally found in Egyptian tombs. In terms of the pigment component, the most unusual feature was the definite presence of malachite and the apparent absence of either Egyptian blue or green frit, the two frit colours which so dominate the conventional Egyptian palette. The findings for the organic fractions were even more unexpected. Analysis of solvent extracts by gas chromatography-mass spectrometry (GC-MS) showed the presence of fatty acids and diacids that are typical of degraded oils. Subsequent analysis by pyrolysis-GC-MS yielded mostly straightchain (alkane/alkene) pyrolysis products, which are consistent with a polymerized lipid; this apparently extensive polymerization implies the use of a drying oil. 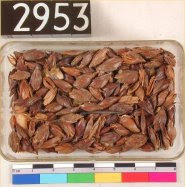 Linseed is the only source of drying oil known to have been available in ancient Egypt, although a number of semi-drying types, such as safflower or poppy oil, may also have been available. Th e presence of such a medium is potentially extremely significant, as the use of oil binders in dynastic Egyptian painting is virtually unknown. The use of an oil binder is unprecedented for such ancient material and may demonstrate a previously unsuspected technology. Regular visitors will also be aware that the British Museum Studies in Ancient Egypt and Sudan is also available online. For a PDF download of this publication, click here. Bad economic news seems to come almost everyday. The cover of the new The Magazine Antiques excites the reader with “American Antiques Season”, but business is slow if not zero, as reported by Bloomberg in its coverage of the Winter Antique Show of the last weekend. The Winter Antiques Show is usually regarded as a barometer of the antique market for the year. The other show at Armory of Lexington and 26 St. appeared to be at most lukewarm. Under current financial crisis, to spend some 5 digits in this kind of antiques show need not only just a thick wallet, but also some impulse that cannot be explained rationally. But impulsive purchases are rare now. Not only New Yorkers in particular look sultry these days, the mood brought by the money shortage has crept into every aspect of the society including universities. Brandies University, facing a huge budget deficit, decided recently to close its Rose Art Museum and sell off the collections. Later, it was amended to provide that only some that can hold the values well in the current art market will be sold. Unlike the majority opinion that appeared online or in the newspaper, I do not hold strong opinions against deaccessioning, in particular with regard to reconfiguring infrastructure of an ailing school. I opened the back of the camera and pressed the eject button (maybe a bit too hard) and the card shot out and fell 50 feet into the dark precipice with all the images from my entire time at the Valley of the Kings stored on it! I was frantic. I informed the group, and we shined a light borrowed from the videographer on the expedition into the precipice and could see the card. We immediately informed the guard at the tomb and were told, “In Egypt, whatever the problem, we will find a solution!” About 15 dreadful minutes passed, and then several men came back with a long rope which one of them wrapped several times around his waist. The others stood as if playing tug-of-war and carefully lowered him to the bottom. Su Bayfield's EgyptSites Heliopolis page. With many thanks to Bob Partridge, Editor of Ancient Egypt Magazine. There is a dark side to archaeology that is seldom acknowledged in Indiana Jones films; namely a long tradition of using excavations to prop up nationalist and colonial claims; to confirm (or occasionally challenge) the truth of religious and classical texts; and to present an idealised picture of groups seen as "ancestors". Things get particularly fraught in relation to the Middle East and "biblical archaeology", yet the same fundamental issues - ethical, political and methodological - apply all the way from Maiden Castle to Machu Picchu. In the Balkans, argues Evangelos Kyriakidis, lecturer in archaeology at the University of Kent, "archaeology has been very significant for national identity". It "played an important role in 19th-century international sympathy towards the Greek national cause; today, the Kosovo issue has important archaeological extensions. Both Greece and the former Yugoslav republic of Macedonia use archaeology in their arguments against each other." But can archaeologists working outside war zones remain immune to ideological influences, conscious or unconscious, which direct them towards what to look for and then convince them that they have found it? Even if individuals inevitably have their biases and blind spots, can the discipline as a whole incorporate the kind of self-correcting mechanisms we find in the other sciences? Can it offer us any kind of objective truth, however partial and tentative, about the past - or will it always be tainted by politics? In 1985, Richard Wilk, now professor of anthropology and gender studies at Indiana University, published a paper, The Ancient Maya and the Political Present, which clearly hit a raw nerve. "It was widely derided at the time," he says. "Some Mayan archaeologists still won't talk to me." Wilk's argument was simple: there is no written evidence for classic Maya culture or its "collapse", so any theories have to be based on archaeology. Many different ones have been put forward. Yet all of them, Wilk argued (and even illustrated with a graph), reflected current concerns: "almost every trend of importance in recent United States history finds some reflection ... in learned analyses of the rise and fall of ancient Maya civilisation". The Vietnam War, the vogue for hallucinogenic drugs, environmentalism, the women's movement, and anxieties about population growth or "big government" all subliminally affected how scholars accounted for the end of the Maya, Wilk said. 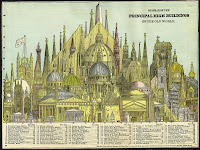 Wilk claimed that our images of the past were influenced by the present - and that this was a good thing. "If the past bore no relation to the present," he argued, "it would be dreadfully boring, even to archaeologists." The stories we want to hear about prehistory are those that either legitimise present courses of action or offer warnings about what we should not do. Although Wilk denied that he was taking the extreme position that "archaeologists are just making up stories about the past", he was certainly undermining any straightforward claims that they could offer us direct access to prehistory. This view is supported by Adam Stout, research fellow in archaeology at the University of Wales, Lampeter, and author of Creating Prehistory: Druids, Ley Hunters and Archaeologists in Pre-war Britain (2008). He worries about the naive view that "better science, better technology, better recording, better techniques will give us an ever more accurate understanding of the past". Although "archaeology today is a broad and on the whole very tolerant church," he says, he fears that "the beasts are gathering". "Archaeology is being driven towards the disciplinary stockade, with the results-driven, answers-not-questions ethos so apparent in TV archaeology, in developer-driven archaeology and increasingly within academic archaeology as archaeologists struggle with research assessment exercise delivery schedules and the need to be seen as productive." So do archaeological methods reveal any sort of truth about the past? Stout is cautious. "The past is a devious, amorphous entity," he says, "very resistant to being skewered by posterity. Nothing about it stays still for long, from the tiniest detail to the grandest of grand narratives; it gets constantly rewritten and re-interpreted. I do think that archaeology is essentially a hall of mirrors - but none the less valid for that. Mirrors are interesting things." Some argue that archaeology is becoming more genuinely scientific and objective. Margarita Diaz-Andreu, leader of the history of archaeology research group at Durham University, makes a distinction between the questions archaeologists ask, which are "very much influenced by our own experiences as people", and the rigour of their methods. "There are more and more techniques/scientific approaches in archaeology to answer our questions," she says. Others dispute this. Ethan Cochrane, lecturer in archaeology at University College London, argues that "there is no archaeological science (yet). (We) use other sciences to explain various aspects of artefacts, asking questions such as: where did the raw materials for this artefact come from? How old is this piece of pottery? What is the isotopic signature of this bone? But the science behind these investigations is not archaeology - it is chemistry, physics and biology. Archaeologists take the answers and use them as data to weave stories about the past." But what happens when outsiders start to "weave stories" about other groups of people? Cochrane is a specialist in the Pacific Islands and notes that in Fiji, where the local people have political power and own most of the land, "their position is not threatened by anything my research might say". In Hawaii, by contrast, "the native population is a colonised and oppressed group", while archaeology "is practised largely by whites and in the context of commercial/rescue archaeology in a scientific vein ... Many see archaeology as yet another act of colonisation and an affront to Hawaiian culture - white people telling Hawaiians what their history means. Archaeology in Hawaii is highly political, as one might imagine, when international corporations owned by non-Hawaiians build luxury hotels and in the process disturb Hawaiian burial grounds." A more striking example is provided by Egypt, argues Lynn Meskell, professor of anthropology at Stanford University. The tourist trade demands Nile cruises, luxury hotels and beautifully presented archaeological sites. Many Egyptians, meanwhile, are expected to provide local colour by living in picturesque poverty or performing a pantomime version of Ancient Egypt in a reconstructed pharaonic village. This has made tourism a source of resentment and even violence - and archaeology can hardly claim neutrality. See the above page for the full story, plus readers' comments. El busto de Nefertiti seguirá este 2009, con 3 mil 300 años de edad y su inalterable sonrisa, su largo viaje entre varias residencias provisionales y en busca de un domicilio definitivo en Berlín, en la Isla de los Museos. La reina del Nilo tendrá que soportar un par de traslados más hasta que se la reinstale por fin en el Neues Museum, la última pieza de la Isla de los Museos berlinés aún en vías de remodelación, que será reabierto el próximo otoño. Nefertiti será presentada ahí bajo una "nueva luz", informó hoy el director de los Museos Estatales de Berlín, Michael Eissenhauer, entre el ala sur y la norte del edificio, restaurado de acuerdo al concepto del arquitecto David Chipperfield. La presentación de la reina tendrá lugar el 17 de octubre, pero antes que ello habrá varios actos preliminares relacionados tanto con la reapertura de ese museo como con la mudanza ahí del que se considera el busto más bello del mundo. Ya en marzo, se invitará a visitar el edificio, en tres jornadas de puertas abiertas, aunque con las salas aún vacías. Nefertiti seguirá por entonces en su residencia actual, en la segunda planta del vecino Altes Museum -Museo Antiguo. Pyramids; Monuments to an Unknown God. All Pyramids are monuments to an unknown God, and in this respect they are all connected. The God in question is now called Gravity, and this makes pyramids, as a phenomenon, simple to understand. Pyramids have been constructed on virtually every continent, and the reason is simple, it’s the tallest form of earth, brick, or stone structure that the God of Gravity will let you build, anywhere, anytime, - that’s the rules. This god’s laws, while not secret, transcended the understanding of most philosophical systems until 1687, when Isac Newton wrote them down. Sadly, in an age of enlightenment, Gravity had missed its chance to be deified. Gravity was an unknown God; unlike the sun, the moon, the wind, or fire, it is unchanging, and so omnipresent - that no one noticed it was there. This God has no prophets, books, scrolls, or tablets. Nevertheless, it was dogmatic, showed no mercy, and did not respond to prayers or sacrifices. The God of Gravity has always destroyed the works of those who transgress its laws, and ultimately, it will crush all creation, - but that’s another story. This makes Gravity a difficult Deity to treat with, and a good deal of circumspection is required. For architects and builders, the God of Gravity has but one simple rule ‘what goes up must come down’, and all those wishing to overt the inevitable collapse of their work for a decent period of time, are obliged to make a pact with this deity. The pact builders make is a simple one passed from generation to generation; Do not transgress the limits you have learnt, because if you stay within the limitations all should be well, but if you go beyond them - ‘on your own head be it’. See the above page for the entire post. I love that blog. American Exhibitions, Inc., in association with the Reiss-Engelhorn Museum of Mannheim, Germany, announced that the blockbuster exhibit Mummies of the World: The Dream of Eternal Life, the largest traveling exhibition of mummies and artifacts, will tour science centers and museums in the United States for a limited three year tour commencing July 2010. "Never in history has there been such an important collection of mummies and artifacts," said Marcus W. Corwin, President and CEO of American Exhibitions, Inc. "This blockbuster exhibit is poised to bring record-breaking attendance to museums in its limited United States tour." Dignified, reverent and scholarly, this unique collection brilliantly enhances our educational, scientific and cultural landscape, as mummification provides a window into the lives, history and cultures of every major region of the world. "The largest mummy exhibition worldwide will include 70 human, animal and reptilian mummies gathered from the four corners of the world," said Dr. Wilfried Rosendahl, Curator of the Reiss-Engelhorn Museum, Mannheim, Germany. "Visitors will embark on an exciting and historical journey around the globe, with mummies representing several continents and spanning thousands of years." Unlike exhibits which feature only Egyptian mummies, this remarkable and compelling exhibition demonstrates the different processes of mummification and serves to educate visitors as to their respective cultures. See the above page for more details. See also the Mummies of the World website. The University of Pennsylvania’s Museum of Archaeology and Anthropology — long considered one of the leading institutions of its kind — last month told the 18 research specialists who make up the research division of the institution that they would all lose their jobs in May. Those laid off include many leading scholars, some of whom have worked 20 or more years at the university, managing research expeditions around the world, running labs at Penn, and publishing widely. These researchers are not tenured faculty members, however, so their positions can be eliminated with relative ease, which is what the museum is doing. While these jobs are being eliminated, the museum is also considering ways to attract a bigger name for itself, and more visitors. The new director, citing budget constraints and changing museum priorities, wants research focused on the collections, not on scholarly inquiry broadly related to the museum’s fields, as the researchers have been able to do. A majority of laymen, politicians and scholars consciously or subconsciously understand settled living as the highest rung on the evolutionary ladder. Accounts of people surviving and even thriving in peripheral areas are often instrumental to construct and maintain the dichotomy between 'the desert and the sown.' It is sometimes stated that mobile peoples obtain their material culture from neighboring settled populations, rather than produce their own, and that they do not leave recognizable archaeological traces apart from 'ephemeral campsites.' From the 24 chapters in this volume, however, it is clear that there is indeed an 'archaeology of mobility.' By applying specific and well-defined methods, it is eminently possible to come to a better understanding of mobile people in archaeological contexts. Such an archaeology of mobility encompasses much more than tracing ephemeral campsites. Much like any other group, mobile people produce, appear to use and discard a distinct material culture which includes functional objects, art and architecture. There have been edited books on the archaeology of nomadism in various regions, and there have been individual archaeological and anthropological monographs, but nothing with the kind of coverage provided in this volume. Its strength and importance lies in the fact that it brings together a world-wide collection of studies of the archaeology of mobility. This book provides a ready-made reference to this world-wide phenomenon and is unique in that it tries to redefine pastoralism within a larger context by the term mobility. It presents many new ideas and thoughtful approaches, especially in the Central Asian region. Italy's ambassador to Egypt Claudio Pacifico will be inaugurating in Cairo the exhibit entitled 'L'approccio italiano alla conservazione delle antichita' egiziane: condividere la conoscenza attraverso la formazione'. (The Italian approach to saving Egyptian antiquities: sharing knowledge through training). 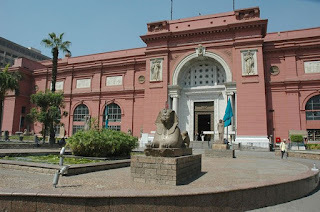 The exhibit dedicated to the re-classification and training programme for Egypt's museum system is financed by the Foreign Ministry and had been already inaugurated on October 26 in the Egyptian museum 'Midan Tahrir' when president of the Italian Republic Giorgio Napolitano visited Cairo. As of 1 February it will move to the Italian Institute of Culture. Our short drive to Memphis from Giza gave us a pretty good picture of Cairo - a very crowded city, just like our own Indian metros! We crossed the Nile once again and entered what seemed to be a huge palm tree forest. We learnt from our guide that Memphis is a Greek word derived from the Egyptian word 'Men-fer' meaning 'stable' and 'pretty'. 'Stable' was pretty accurate as Memphis stayed at the centre of Egypt's word right till the era of the Pharaohs, including the New Kingdom when Ramses II increased its splendour. It was one of the largest and the most beautiful cities in the East, surrounded by an enchanting landscape. Successive wars, invasions and the annual Nile flooding eroded the city till one day it was wiped out, leaving for posterity just tantalising remnants of its grandeur. The main attraction in Memphis is the grand colossus of Ramses II which stands 12 metres long and is now in an open-air museum along with several other beautiful statues and sarcophagi. This statue, carved from a single block of stone and currently kept in a horizontal position, isn't remarkable merely for its size. The intricacy of its detailing is truly mindboggling. A council which was duped into paying £440,000 for a fake Egyptian statuette said today that it hopes to put the sculpture on display in a local museum. Bolton Council bought the 20-inch Princess Amarna in 2003 after it was authenticated as 3,300 years old by the Egyptology department at Christie's and the British Museum. In fact, the figurine of the granddaughter of King Tutankhamun was crafted by master forger Shaun Greenhalgh, 48, in his garden shed in just three weeks. The Princess Amarna is now in the hands of London's Metropolitan Police, but Bolton Council plans to borrow the statue for a special display in Bolton Museum's Egyptology section. A council spokesman said: "The Amarna statue remains the property of the London Metropolitan Police as ordered by the judge, and therefore could never be housed at Bolton Museum permanently. "However, we are currently looking into the possibility of the statue being temporarily returned to be put on special display." The Egyptian assistant secretary of state for African affairs, Mona Omar left Cairo on Wednesday to attend the African foreign ministers meeting in Addis Ababa ahead of the African Union summit. Omar told reporters before leaving that Egypt will mobilize support for Egypt’s candidate for the post of UNESCO director general. Egyptian Minister of Culture Farouk Hosni has been nominated by the African Union to contest for the job. Docent Jaana Toivari-Viitala heads the first-ever research project managed by Finns in Egypt. The first field season is now over at the hut village of the workmen who built the tombs in the Valley of the Kings. However, the archaeologists working on the excavation have found that they still have a great deal to do. The sun, the wind and tourists have left their mark on the village, originally discovered by Bernard Bruyère in 1935. The hut village offers rare insight into everyday life in ancient Egypt. The face of an Egyptian mummy at Otago Museum has been revealed for the first time in over 2,000 years. The 35-year-old female aristocrat has been part of the museum's collection for more than a century. The facial reconstruction of the mummy is the result of over a year's work by a team from Otago University and they are confident that their modern day model is extremely accurate. The team developed an advanced method of facial reconstruction, which more accurately recreates the soft tissues like nose and skin surrounding the skull. Previous methods have more guesswork and left the process open to artistic interpretation. This short book asks a series of timely questions about the nature of archaeological enquiry; the place of humans in the natural world; the nature of culture and the language used in archaeological writing. At the core of the book is a call for a reconsideration of the implicit assumptions and concepts we engage as archaeologists and the ways in which our experience of the modern(-ist) world affects our reading of the archaeological materials we encounter. Does mass access to quick and easy international travel, for example, have implications for how we understand concepts of ‘the local’ and does a shrinking world mean that we place less stress on place, distance and the concept of the journey? Can the products of a society which is dependent on the written word really understand what it is to be pre-literate? Does the rise of an ‘on demand’ culture which is less dependent on face-to-face interaction have implications for understandings of tradition, history and socialisation? Chapter 2 of the book explores how globalisation has affected archaeological interpretation and Insoll attacks recent, ego-centred work (such as phenomenological studies), calling for a reassessment of how we think about social groups and the concept of community. See the above page for the entire review. Two pyriform formations were identified within a bundle of linen bandages wrapping a 15–18 months old Early Dynastic mummy. The upper one was taken out of the bandages and examined to ascertain its nature. This formation showed to be a small bag closed by a knot containing an emerald-green mineral. For identification and with the aim of identifying the compound kept inside it, several different green minerals used for adornment in Ancient Egypt (from the Pre-dynastic period up to the Ptolemaic one) were examined by scanning electron microscope (SEM-EDX) followed by microanalysis. The pyriform formation's content is consistent, based on morphological and micro-analytical data, with the natural cryptocrystalline hydrated copper silicate identified as a bead of chrysocolla. The use of chrysocolla was less common than that of malachite as chrysocolla ores were rarer. To present days, only one other example of chrysocolla as a funerary equipment from an Ancient Egypt child burial can be traced. Since our archaeological finding indicates the presence of a chrysocolla bead in one other infant burial, it is possible that the use of this particular mineral was limited, in the Early Dynastic Period as a protective amulet for children. Textural, mineralogical, and X-Ray fluorescence (XRF) analyses are used as a cost effective method to distinguish for the first time ancient Egyptian and Nubian-style ceramics found in Nubia. Textural and mineralogical data suggest that Nubian-style sherds are mixtures of sand, silt, and clay sediment that is generally finer grained and poorer in quartz than is the sediment mixture used to produce Egyptian-style pottery. Chemical data also establish a significant difference in the amount of chemical variation found within each style population, but nonetheless supports a considerable overlap in the possible provenance of both styles. 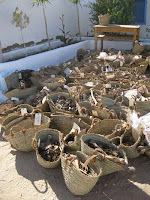 Observations and data obtained during this study indicate that standardized, Egyptian-style manufacturing was introduced into Nubia under colonialism, without substantially altering the diversity of native methods of production. The Egyptian archaeological mission unearthed a 250-meter-long the big dam which had been built to protect Karnak Temple against the risk of floods and the second river port built by the ancient Egyptians to facilitate visits to the ancient temple. In statements on Monday, Dr Zahi Hawwas, Secretary General of the Supreme Council of Antiquities said that the mission discovered last year the first river port of Karnak, which consists of a huge ramp leading to the ancient Nile River, used to bring stones and sacrifice into the temple. King Taharqa (690-664 BC), Nubian pharaoh during the 25th dynasty, built a royal slope in the middle of the ramp to divide it into three sections, Hawwas added. 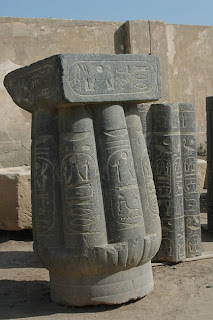 Thanks to Kate Phizackerley for posting the above link to her News from the Valley of the Kings blog. Conservators and excavators on the Abydos Middle Cemetery Project will be working at Abydos in 2009. There is a space-holder on the menu on above site for a blog and other features. Here's an extract of the introduction to the 2009 season. See the above page for full details, with illustrations. During 2009, the AMC Project archaeologists will explore an area roughly east of the Idi/Nekhty tomb complex. Previous seasons have revealed votive chapels, a votive stela, and shaft graves in this area. At Abydos, these tombs are constructed of mud-brick. Inside the mastaba, a deep shaft is dug into the ground, with the burial chamber at the bottom. Mastaba tombs also contain a chapel, where offerings to the spirit of the deceased could be left by his decendants, and a Serdab room. The Serdab room was completely enclosed and contained a statue representing the spirit of the deceased. Typically, the room had a small slit or opening in the wall which allowed the soul of the deceased to move about freely. KUWAIT: A lecture on the restoration and preservation of Middle Eastern heritage was delivered at the American University of Kuwait(AUK) on Sunday. Dr. Jere Bacharach, Director Emeritus at the University of Washington's Jackson School of International Studies and a world-renowned Middle East studies scholar, spoke during the occasion. Dr. Hesham Al-Awadi, a professor at the AUK, hosted the event. Kuwait is a country with a rich and varied cultural history, with artifacts dating back to pre-Islamic times, including the era of Alexander the Great. Without proper restoration and reservation, these treasures are at risk of being lost to future generations, Bacharach said. The professor went on to say that contemporary restoration of ancient works combines the experience of local archeologists, scientists, and artists with the best technical experience of the international community. Sites throughout Egypt are a testament to this unity: an international team composed mostly of Italians restored the frescoes of the Roman basilica in the Temple of Luxor, German and Polish specialists spearheaded the restoration of Kom Al-Diqqa's tile mosaics in Alexandria, and local Egyptian artisans are at the forefront when restoring masonry and woodwork. The development of field schools, where students gain real-life experience in the preservation of artifacts, is an essential part of local cooperation with international teams. "In Egypt, you can become an inspector of antiquities by going to university and getting a piece of paper, but never get your hands dirty," said Bacharach. But with the implementation of field schools, "Egyptian inspectors do all the type of archeological work everyone else did. A second [element of successful restoration] that is still new to Egypt, where in fact, Kuwait is well ahead of Egypt in creating conservation labs, where people are trained to work with [...] the type of historic material that you have here at the Rajab Museum or the Kuwait National Museum. This companion volume and catalog to the exhibit that opens on February 9, 2009, traces the life of Meresamun whose mummy, dating to about 800 B.C., is one of the highlights of the Oriental Institute’s Museum. The text introduces the historical and cultural setting of Egypt during her time. Essays and artifacts examine the role of music and of musicians in Egyptian temple cults, their training, and the types of musical instruments that Meresamun would have used. The life of Meresamun outside the temple is explored, with emphasis upon her social and legal status, what other professions were available to her, and what home life was like. The study of the life of this individual is augmented by forensic evidence obtained with the newest generation of CT scanners that sheds light on Meresamun’s life and death. In cooperation with Berlin's world-famous Egyptian Museum and Papyrus Collection, the Deutsches Elfenbeinmuseum Erbach (Erbach German Ivory Museum) presents Akhenaten and Nefertiti: Rulers in the Divine Light (April 3-August 9, 2009). Some 70 works of art from Egypt's Amarna Period are superbly displayed, each produced during the 17-year reign of the enigmatic Pharaoh Akhenaten (r. 1352-1335 B.C.) and Nefertiti, his principal wife. See the above page for more details. It looks great - wish I could go! Egypt, Gift of the Nile, a travelling exhibit from the Royal Ontario Museum, opens at the Guelph Civic Museum on Saturday, Jan. 31. . . .
Egypt, Gift of the Nile explores Egyptian civilization through its 10 centres: Introduction, Personal Adornment, Make-up and Perfume, Feeding the Household, Buildings Large and Small, Family Life, Education, Religion, Funerary Religion and the Afterlife. Also included with the exhibit will be hands on activities for children. The exhibit continues at the Guelph Civic Museum until March 29, 2009. Details of the Guelph Civic Museum in Canada can be found on the Guelph Arts website. Thanks very much to Chris Townsend for sending me details of a lecture by John Coleman Darnell at the Benjamin T. Rome Auditorium of the Johns Hopkins School of Advanced International Studies in Washington, DC.. Chris says that it was an excellent lecture focusing on the southern oases during Pharaonic times. The lecture was delivered to the Washington DC Chapter of the American Research Center in Egypt on 23rd January 2009. “The primary and shortest artery of pharaonic expansion into Kharga Oasis was the Girga Road, linking the Thebaid and northern Kharga Oasis. Archaeological and epigraphic material from several sites on the high plateau portion of the route reveal a development of pharaonic interest in Kharga, and evince changes in the Nilotic government's approach to the administrative and economic integration of Kharga Oasis into the pharaonic realm. Although Old Kingdom campsites along the route attest to the visits of small numbers of self-sufficient travellers, the first outposts of the Nilotic administration appear during the Middle Kingdom. The site of Abu Ziyâr, east of the mid-point of the high plateau portion of the Girga Road, represents a change in the pharaonic approach to the route, and to the development of Kharga Oasis. “Already Monthuhotep II advocated the incorporation of the Oasian and Lower Nubian economies into a greater pharaonic ‘commonwealth’, and archaeological and epigraphic evidence from the Abu Ziyâr site reveal a concerted effort during the early Twelfth Dynasty to expend government resources – both in men and material – on the southern oases. A major object of these exertions was the development of Gebel Ghueita and its environs within Kharga Oasis, where several sites reveal a considerable population copying Nilotic ceramic forms and fabrics. 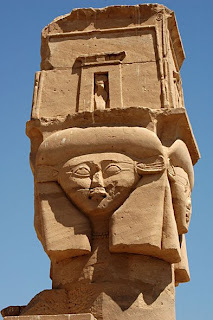 The rise of Gebel Ghueita, and perhaps other pharaonic bases, within Kharga Oasis corresponds to the abandonment of the Abu Ziyâr outpost by the late Twelfth Dynasty. John Coleman Darnell is Professor of Egyptology, Director of the Yale Egyptological Institute in Egypt (including the Yale Theban Desert Road Survey and the Yale Toshka Desert Survey), and Chairman of the Department of Near Eastern Languages and Civilizations at Yale University. He studied Egyptology at the Johns Hopkins University, the University of Cologne, and the Oriental Institute of the University of Chicago. He has worked in Egypt for over twenty years, as epigrapher and senior epigrapher with the Epigraphic Survey of the Oriental Institute from 1988-1998, and as director of his own expeditions since 1992. His Egyptological interests have focused on Egyptian religion, cryptographic texts, rock inscriptions, and the archaeology and epigraphy of the Western Desert roads. After successful appearances in Berlin, Paris, Bonn and Madrid, Egypt's Sunken Treasures, the ticketed exhibition of some 500 artifacts from the submerged Nile RIver Delta towns of Alexandria, Heracleion and Canopus, is on view in the Scuderie Juvarriane of La Veneria Reale in Turin, Italy from February 7 to May 31, 2009. Thanks to Steve Wagner and Chris Townsend for this link. The Metropolitan Museum of Art invites you to hear the fascinating story of the Tomb of Perneb. Acquired from the Egyptian government in 1913, the tomb was constructed approximately 4,000 years ago, when the great pyramids were built. Brought to New York and reconstructed, the mastaba, the upper chamber of the tomb, now welcomes visitors into the museum’s impressive gallery of Egyptian art. I was at New Kalabsha in March 2007. 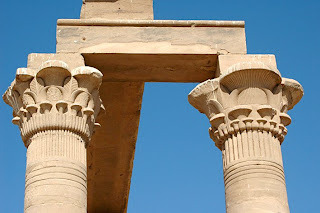 The Lake Nasser sites have some very good memories for me and it is a pleasure to see them through Bob's very precise eyes. Egyptian archaeologists have discovered a pier used by ancient Egyptians to access the Karnak temple complex during the dry season in the southern city of Luxor, the Egyptian government said on Monday. The discovery was further evidence of the importance the complex held in the religious life of ancient Egypt, as other temples had a single dock, according to archaeologist Mansour Boraik, who led the expedition that uncovered the dock. "In light of the importance of the Karnak temples, which represent the primary home of the god Amun-Ra, the ancient Egyptians built this secondary dock to use when visiting the temples during the dry season," Boraik said. Amun-Ra was one of the most important gods of the ancient Egyptian pantheon, variously identified as a god of creation, fertility and the sun. The Karnak complex is a massive, largely open-air religious site that houses several sanctuaries and temples dedicated to different gods, avenues flanked by sphinxes, an obelisk and a sacred lake. Boraik said the pier led to a platform 2.5 metres (yards) by 5 metres, in contrast with a much larger dock used during the flooding season to handle cargo, sacrificial animals and stone blocks. A very entertaining (and unflinching) account of what it's like to live in a dighouse in Dakhleh oasis in the Western Desert. Aislinn starts off with an account of meals (extract below) but if you have a weak stomach on the subject of primitive toilet facilities then you may want to skip that paragraph that follows it! Anyone who has spent any time in the desert will know the truth of some of the absolute basics mentioned by Aislinn in this post. Good photos too. Great fun. The dighouse sits a few miles outside of the capital of the Oasis, Mut, and lies atop a small hill that we share with the dighouse for the Dakhleh Oasis Project proper. Daily life at the house begins at 8:00AM with breakfast (my favorite meal of the day!). Lunch is always enthusiastically received at 1PM and dinner at 7PM. Basically our eager stomachs drive our desires and occupies our thoughts as nearly all the students count the minutes until the next mealtime; a habit we have grown comfortably accustomed to due to our outstanding kitchen and our love of food ;). Tea is served midmorning and mid-afternoon to break up the extended periods of library and work time (and give our stomachs yet another event to look forward to!) and is graciously received. It would be a safe estimate to say that in the past month I have consumed more tea than I did the entirety of last semester and I have grown very fond (dare I day dependent?) on its daily presence. Stan has been busy over the last week or so. His most recent update to the Suite101 website is this update to an existing article, which gives details of Egyptian art exhibitions in 2009 (ongoing, current and upcoming). A very useful reference. The art and archaeology of ancient Egypt are the subjects of 13 museum exhibitions in 2009. Many focus on Tutankhamun, the Eighteenth Dynasty's most famous pharaoh. This article dates back to August 2008, but I didn't pick up on it then. Thanks to Kat for sending me the link. MUON DETECTORS HAVE a rich history of revealing the unusual and the unseen. Sixty years ago, scientists in Australia used them to measure layers of mountain snow. Today, Japanese scientists are testing them as a way to track magma rising in volcanoes. Border patrol agencies in the U.S. see the technology as a potential way to uncover radioactive materials hidden inside cargo containers and trucks. It was about 40 years ago that archaeologists tapped muons for the first time. 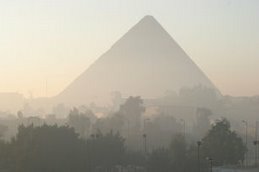 Luis Alvarez, a Nobel Prize-winning physicist at the University of California, Berkeley, wondered if muons might reveal chambers in the Second Pyramid of Chephren, one of the three great pyramids of Egypt that had somehow escaped the notice of archaeologists and looters for 4,500 years. Alvarez and his team put a detector in the Belzoni Chamber, near the centre of the pyramid's base, and left it to collect muons for two years. They concluded that no additional chambers were hidden in the limestone above, although the scan could distinguish the four edges of the pyramid and what remained of its smooth limestone facing. While it would have been more exciting to discover a new chamber, this information still proved valuable for Egyptologists and archaeologists studying the pyramid – and it showed that the technique worked. 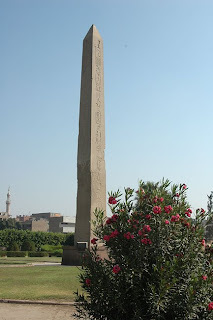 See the above page for the full story, which is not exclusively about Egyptian monuments. the above extract comes from the second page of the three page article. He has just laid out his big hedgehog idea in an important anniversary lecture. It is a text by which future museum policy, here and elsewhere, will be defined. It represents a new, deeper, global statement of what the hedgehog knows. He wants to turn the BM into “the private collection of every citizen in the world”. There are national museums all over the world, telling local stories, but there are only a handful of museums in which national cultures can be compared. Of these, the BM is the most comprehensive and, thanks to Hedgehog MacGregor (now in the seventh year of his reign), the most ambitious. He wants to create a worldwide network of curators trained to know the contents of the BM. Thanks to Kat for pointing out that MacGregor says that there are plans for an exhibition focusing on on the journey of the soul in the Egyptian afterlife, at some point in the future. It is always good fun to see history unfolding on the annual dig diaries. It is only a shame that more missions don't employ this simple device to inform and involve. 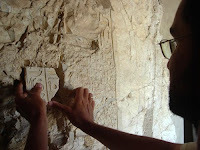 After some time Sayeed turned the piece over to remove surface materials, and we see that its back pillar is nearly complete and the inscription intact. That is good news indeed. Soon we ask for the piece to be taken to Hiroko’s tent for cleaning, and the instruction to the young man given the task is to carry it “like a baby”. So that is what he does! Later in the day Jay’s photograph shows you how truly special this piece is. Cleaning will be slow, but the information will be informative. We can already see that the owner had a title associated with the Mut Temple. Brooklyn is continuing to have a good season at Karnak, in the vicinity of the sacred lake, and their most recent post has some excellent photographs of the scale of the work area - from wide shots over the entire scene to individual details of aspects of the site. Details of both excavation and restoration work are detailed. At the end of last season we covered the baked brick building north of the Sacred Lake with plastic and sand to protect it and its plastered surfaces while we were gone. Our first job on January 17, our first day of work, was to uncover the building again. The structure was built atop a mud brick mass that slopes away to the south toward the lake. We believe this mud brick to be the remains of the 18th Dynasty enclosure wall, much worn by time and the frequent flooding of the sacred lake. By mid-week the line where mud brick and wind- and water-borne soil meet was clear (left). By week’s end we had uncovered the south face of the mud brick all the way across the area. In the foreground of the picture on the right are baked bricks from the building above that tumbled down the slope as mud brick supporting them eroded. At the tomb of Djehuty the team are processing pottery, with additional help brought in to assist with the work, and are continuing to explore the tomb itself. Hace unos días nos quedamos con la miel en la boca, cuando excavábamos el pozo de la tumba debajo del enterramiento de Iqer y descubrimos que estaba inacabado. Para resarcirnos, no dándonos por vencidos, hemos seguido excavando por debajo del muro de adobe de Djehuty y hemos descubierto que la tumba continúa más adentro, siguiendo el eje del pasillo de entrada. Es decir, que la pequeña sala donde estaba el pozo era sólo eso, una sala dentro de la tumba más grande. La excavación es complicada y debemos tener mucha precaución con el muro, por lo que hemos comenzado haciendo una cata en el derrubio que bloquea la entrada. At the KV63 website a new section has been added - Photos 2009. At the moment this page shows members of the team engaged in various activities. Just click on the image to see a bigger version. It never occurred to me to start searching for websites in the Netherlands for information about the current work being carried out in the Faiyum, but thanks to the recent email from Rinus I've found a couple of news reports. This one has quite a lot of detail in it. In Karanis, tachtig kilometer ten zuidwesten van de Egyptische hoofdstad Cairo, ligt de Romeinse tijd tussen tichelstenen muren in het zand. Amforapunten, scherven, stukken glas en een groen uitgeslagen munt: het kost amper een minuut om het op een volkomen willekeurige plek te verzamelen. René Fransen doet verslag van het archeologisch onderzoek. De eerste vijf, zes eeuwen van onze jaartelling was Karanis een belangrijke stad, een spil in de graanhandel van het Romeinse rijk. Gelegen in de vruchtbare Fayumregio van Egypte, waar een zijarm van de rivier de Nijl op een bergrug vastloopt en een groot meer vormt. Maar het Romeinse rijk viel uiteen, het waterpeil in het meer zakte, de graanhandel droogde op en Karanis liep leeg. De wind kreeg vrij spel en bedekte de stad met woestijnzand. In de eeuwen waarin de stad werd bewoond, ontstond een dikke laag organisch afval, vruchtbare grond dus, die net als de terpaarde in Noord-Nederland werd afgegraven door lokale boeren. Aan het begin van de twintigste eeuw kreeg een Italiaans bedrijf de concessie om deze sebbakh op grote schaal te winnen. Toen er stukken papyrus tevoorschijn kwamen, raakten egyptologen geïnteresseerd. Tussen 1925 en 1935 werden de eerste ruïnes van Karanis opgegraven door archeologen van de universiteit van Michigan (VS). ,,Bij eerdere opgravingen lag de nadruk sterk op papyrus en de architectuur. Al het andere materiaal werd min of meer terzijde gelegd'', vertelt René Cappers van de Rijksuniversiteit Groningen. Hij is paleobotanicus, gespecialiseerd in onderzoek naar oude plantenresten, en heeft al enkele jaren de leiding over een nieuwe opgraving in Karanis. Die leiding deelt hij met egyptologe Willeke Wendrich, opgeleid aan de Universiteit Leiden, maar tegenwoordig werkzaam voor de University of California in Los Angeles (VS). The exhibition, on view from February 13 to May 19, 2009, presents 30 Late Antique works (395-642 A.D.), many genuine, alongside reworked or repainted objects and a number of modern forgeries in an ambitious attempt to explain how imitations made their way into the institution since World War II. Carved from a soft Egyptian limestone, the sculptures on view are rich in pagan and Christian symbolism. Funerary portraits are joined by statuary from Coptic cemeteries, churches and monasteries. Many were acquired in the 1960s and 1970s, a period when scholars knew very little about these works of art in European and American collections. Suspicions about their authenticity subsequently developed. Now experts believe that the Late Antique forgeries were carved from ancient stone remnants. Their emphasis on Christian themes and iconography reflect the interests and tastes of the sculptures' buyers at the time of their purchase. Stan goes on to list those artefacts in the display which are genuine and those which are probably forgeries. There are some excellent photographs to accompany the piece. For those of you unfamiliar with his work Fathy was an Egyptian architect who returned to traditional materials and techniques to design and build very beautiful buildings which were practical for the Egyptian climate and social traditions. In 1980 he was awarded the Aga Khan Award for Architecture Chairman's Award in 1980. There are photos of his work on the KMT Space website and the Fathy Heritage website. The international mission constituted by a representative of CRAterre - ENSAG and Chair of UNESCO for Earthern architecture, Egyptian architects, academics and experts in adobe architecture as well as the founder members of the association, has noted that since the creation of the SAVE THE HERITAGE OF HASSAN FATHY in February 2008 and despite the support of the international community, Egyptian and international institutions as well as the honorific patronage of H. E. Madame Suzanne Mubarak, New Gourna is continuing to deteriorate daily. The most alarming fact that should be stopped immediately is that behind the theater of New Gourna village, on the beautiful esplanade planned by Hassan Fathy for events and festivities, two new concrete buildings are being constructed. See Jane's post above, for more. Recent discoveries by a Polish archaeological mission at Tel Al-Farkha (literally "the chicken hill") in the north-eastern Delta about 120 kilometres north-east of Cairo are remarkable and sensational. Remarkable in that they reveal that the "Two Lands" of Upper and Lower Egypt were not rivals in predynastic times but culturally united. Sensational in the material objects discovered. They include numerous statuettes and amulets carved of hippopotamus tusk, and several dozen golden plate fragments came to light, the latter arduously reconstructed into figurines of exceptional beauty. Although a mere 60 centimetres in height, these naked standing men have eyes made of lapis lazuli, while various details such as sticking out ears, large phalluses, and detailed fingers and toes reveal characteristics of later Pharaonic art. "From almost the very beginning of our work it became obvious that the scientific value of the site was tremendous, and might lead to a completely different view on the processes resulting in the emergence of the pharaonic civilization," wrote M. Chlodnicki and K. Cialowicz in Ivory and Gold, a photo-documentation of the Polish excavation of the site in the 2006 and 2007 archaeological seasons. The mission uncovered an extensive settlement and they were thrilled to find, in a large pottery vessel, the above objects "which have no counterparts in finds from the other sites with early Egyptian architecture and art". They have been dated to the time of Dynasty "O" and the beginning of the First Dynasty (c. 3100 to 3000 BC). If you are interested in Tell el Farkha I summarized last summer's Sackler Lecture Ivory and gold in the Delta: Excavations at Tell el-Farkha. Krzysztof Cialowicz, Institute of Archaeology, Jagiellonian Univesity, Krakow, Poland. The lecture notes can be found on this blog by clicking here. An Egyptian antiquities collection at the …stergötlands Country Museum in Stockholm, Sweden, will soon be back in its homeland, Nevine El-Aref reports. After being on display for almost five decades at the …stergötlands Country Museum in Stockholm, a collection of 212 artefacts ranging from the early pre-dynastic era right through to the Coptic era will be coming home soon. The story of the collection goes back to the late 1920s when Otto Smith, an antiquities lover, excavated several archaeological areas in Saqqara and Luxor during his several visits to Egypt. The 212 objects he is known to have unearthed included wood and ivory arrows, painted and plain clay vessels, pots, fabrics, chandeliers, mirrors with a design of the goddess Hathor, wooden combs and limestone reliefs with ancient Egyptian engravings as well as marble, limestone and granite statues depicting Pharaonic deities and nobles. There are also a number of marble vases, rings made of animal bone, beads and coloured scarabs. Smith kept his priceless collection at his house in Stockholm all through his life until he died in 1934. In 1956 his grandson, who was not able to take care of it, sent the collection to the neighbouring …stergötlands Museum for restoration. In 1959, Smith's family offered the 212 pieces to the museum according to a contract preserving the family's ownership of the objects as well as the right to recover it at anytime if it was subjected to deterioration or negligence, placed in storage or removed from its current display at one of the museum's galleries to any other place in the museum. Regrettably, over the last 10 years successive visits to the museum revealed that the administration had violated the articles of the 1959 contract as 163 items of the collection had been removed from their original display at one of the galleries to its restaurant, which is located at the basement, while the others had been stored. 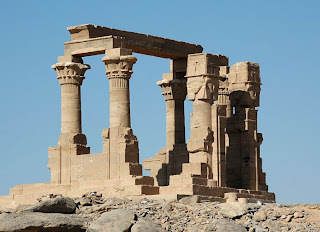 Geoffrey Tassie has highlighted the challenge the archaeology of the Faiyum on a number of occasions, but the news never seems to get any better, as the demands of tourism and agriculture see the ongoing destruction of archaeological sites. Rinus Ormeling has just returned from the Faiyum where he was working on a fieldschool with Willeke Wendrich, the director of the Fayum Project. He was doing botanical research in the Greco-Roman town Karanis, but at the same time others were working on the prehistoric sites Kom K, Kom W and E29H1. These and other Faiyum sites of the same period are of enormous importance to an understanding of the development of ancient Egyptian food production as, together with the site of Merimde Beni Salama, they represent both the very earliest mixed farming in Egypt and the economies that came before. The earliest part of E29H1 dates to the Epipalaeolithic period and consists of “a vast scatter of artefacts on the gently sloping expanse of lacustrine sediments” (Wendorf and Schild 1976, p.182) in an oval area measuring around 300x100m that overlook a basin. Because the Epipalaeolithic site is situated within a larger Neolithic concentration of artifacts, it was divided into different areas. The Epipalaeolithic areas are named A, B and C. Areas A and C were partially excavated and collections were carried out in a small part of Area B. The fauna from E29H1 suggests that it was a fishing economy using hunting and plant gathering as a back-up. These sites appear to be contemporary with Wenke’s FS-2. Artefacts include lithics and bone tools. During the Neolithic there is a large surface scatter of artefacts surrounding the earlier Epipalaeolithic concentration including “grinding stones and a very few potsherds, all heavily wind polished” (Wendorf and Schild 1976 p.182). Rinus says that it turned out that farmers were starting to irrigate at the site of E29H1 and that they were on the point of turning over the ground in order to plant crops. So a rescue survey was launched. The survey director was Willeke Wendrich, but the survey was carried out by Simon Holdaway from University of Auckland (NZ). Rinus says that he left a week before the survey ended, but that now there are some olive trees growing at that site. If you speak any Dutch there are some nice accounts of some of the things Rinus was working on in in Egypt recently at the WaarBenJij.nu website. And no, I'm not about to start doing Dutch translations - the last time I actually used to speak the language properly was 30 years ago! Tel Basta is an archaeological site in the city of Zagazig, in Sharqiya governorate. It was very important in ancient times because it was sacred to a goddess called Bastet, who took the form of a cat. Beginning in the Old Kingdom, several kings built temples there dedicated to Bastet. A large cemetery for cats was also found at the site. When the ancient Egyptians worshipped an animal, they did not worship each individual one in itself. They worshipped what the animals represented -- they saw cleverness and wisdom, for instance, in the ibis and the baboon, and so they honoured these animals as representatives of Thoth, the god of wisdom. We say in Egypt that cats have seven souls, and it seems that we have learnt this from the Pharaohs. Bastet was found at many sites other than Tel Basta. The most important was the site of Saqqara, where tombs that are now known as the "doors of the cats" were discovered. Thousands of mummified felines dating to the Late Period were buried there. Alain Zivie, a French archaeologist, cleared the remains of the cats and found that the tombs were actually unique burial places for high officials of the New Kingdom. One of these tombs belonged to Aperia, who was prime minister under Amenhotep III of the 18th Dynasty, the father of Akhenaten. Thanks to Jane for another set of lecture notes. When KV63 was found that was a lot of speculation about the contents and the date. Various things give us a clue. The shaft of the tomb had a slight overhang which Otto Schaden believes to be the signature of the craftsman that created the shaft and this is present on tombs KV55 and KV46. The tomb was found under 19th dynasty huts indicating it was before that time. There were seals similar to those found at KV62 Tutankhamen and KV54 of the jackal and nine bound prisoners. This lead to speculation that the tomb was from the period of Amenhotep III which seems plausible at the time. There was also speculation that the coffins were female because they were painted yellow. Artistic style in Egyptian wall art shows men as red and women as yellow. So a yellow coffin means female. Thanks to Stan Parchin for the following articles. The first is dated 30th December, and is entitled "Economy Keeping King Tut Down". It suggests that ticket sales for Tutankhamun in the US are down, probably due to the economic situation. The second one is dated 20th January, less than a month later, and is entitled "Dallas Museum of Art Attendance and Membership Soars to Historic Highs in 2008". It says that Tutankhamun was responsible for museum attendance being a runaway success. I suppose that whether or not you see it as a success or a failure depends on how you are measuring success! When King Tut rolled into town in October, Bonnie Pitman, the new director of the Dallas Museum of Art, predicted that 1 million visitors would see the show, with ticket buyers traveling from hundreds, even thousands of miles away. "I don't see this as a huge moneymaker," she said at the time. "Our goal is to break even." But neither Ms. Pitman nor the international promoters of "Tutankhamun and the Golden Age of the Pharaohs" expected the financial crisis that has the global economy in a tailspin. So how is the boy king doing? "Like every institution," Ms. Pitman said this past week, "we have been impacted by the economic climate." The Tut exhibit has drawn more than 270,000 visitors during its first three months, Ms. Pitman said, with 90,000 of those being schoolchildren, who, like other large groups, purchased discounted tickets. With less than five months to go before the show closes May 17, the DMA would have to draw 730,000 to reach the 1 million mark. That would be an average of 146,000 a month, which exceeds its current average of around 90,000 a month. The Dallas Museum of Art reached historical highs in attendance and membership in 2008, thanks to the opening of a groundbreaking new education facility and ambitious schedule of major exhibitions and new programs. Museum attendance, which had increased by 100% over the past five years, soared in 2008 to include over 766,000 visitors, highest number on record for the DMA. In addition, six thousand new members joined last year, marking a 25% increase and bringing the DMA’s membership total to over 25,000 (households/people). This year’s success can be attributed in part to the Museum’s presentation of “Tutankhamun and the Golden Age of the Pharaohs,” which marks the first time that treasures from the tomb of King Tutankhamun – the greatest archeological find of the 20th century – have been seen in the Southwest. To date, more than 350,000 tickets have been sold to the exhibition, which opened on October 3 and runs through May 17, 2009, already making it the DMA’s most-visited exhibition in the Museum’s 100-year history. See the above links for more.